Animal Advocates are a very different breed of people. We are compelled to see the pain inflicted on innocent beings and we are moved to speak out against these atrocities. Many times I’ve heard, “I don’t want to see that!”, or “I don’t want to hear about that!” , but if everyone turned a blind eye and a deaf ear to the pain and suffering of animals in this world, there would be no one to speak up on behalf of the animals; no one to cry out, “This is wrong and needs to stop!” Of course the pictures are difficult to look at and the stories are hard to read. Imagine what it must be like for the animals that are being tortured, abused and neglected! Can you imagine being caught in a leg-hold trap and chewing your own leg off to try to escape the terror?! What of the millions of animals that are beaten before having their fur ripped from their bodies, some still alive while this happens, just so they can become “fashion”?! What about the companion animals who place their lives and their trust in our care, only to have that trust destroyed, their spirits and bodies broken and their lives snuffed out?! Imagine having your body experimented on, injected with drugs, cut open, all without your permission, while you’re still alive! We get off easy with only having to look at the pictures or read a story. We haven’t had to live the experience or feel the sheer terror and utter despair. So while some are unable to cope with the images and stories of animals suffering and turn away, Animal Advocates are unable to ignore the actual suffering of the animals and are moved to do something about it. We don’t turn away from the horror, instead we create and sign petitions, write letters to government officials, organize, publicize and attend rallies, strive to raise public awareness and in short, dedicate ourselves to bring about change. We honour the animals by bearing witness to their suffering and being their voice. 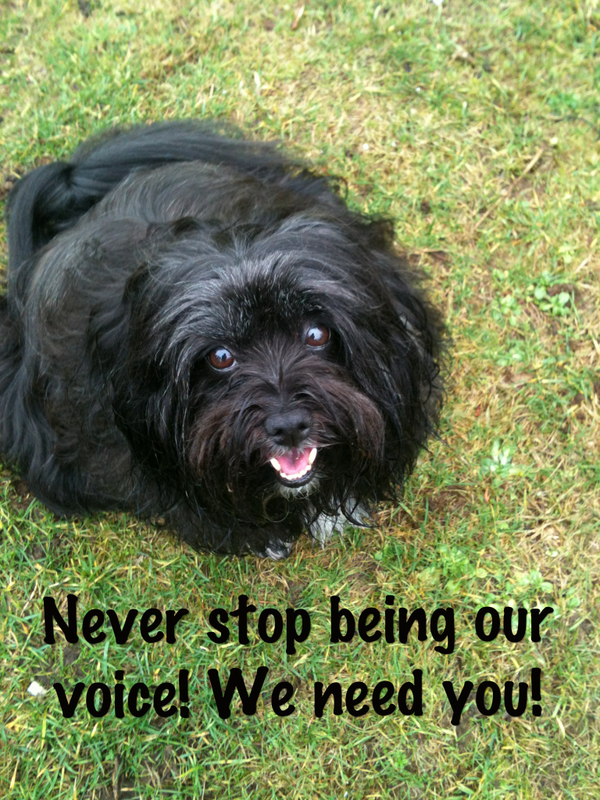 I believe this is a very important task and I for one, will never stop being their voice….they need to be heard! Thank you so very much Liz for simply being you.